Nancy Wu 胡定欣 Came To Malaysia For Filming of Episode for “Astro Wellness On The Go 2” “星级健康2”! Friendly Match with Malaysia famous fighter Ella 陈佩彬! 9th July 2014, Kuala Lumpur – Under the cross-country cooperation between Astro Wah Lai Toi 华丽台 and TVB , the health info programme, “Astro On The Go 2” “星级健康2” has featured ,many TVB artistes in the previous few episodes. This time around, the featured TVB artiste is Nancy Wu 胡定欣 who has come over to Malaysia TNT Kickboxing centre to film the “Muay Thai” themed episode of “星级健康2”. In the recent years, Thai style kickboxing has become the latest trend. It is not as rough as we imagined. In fact, it is a very good sport for women to keep their bodies fit. In order to become the host for this episode, Nancy has trained for quite some time in kickboxing. 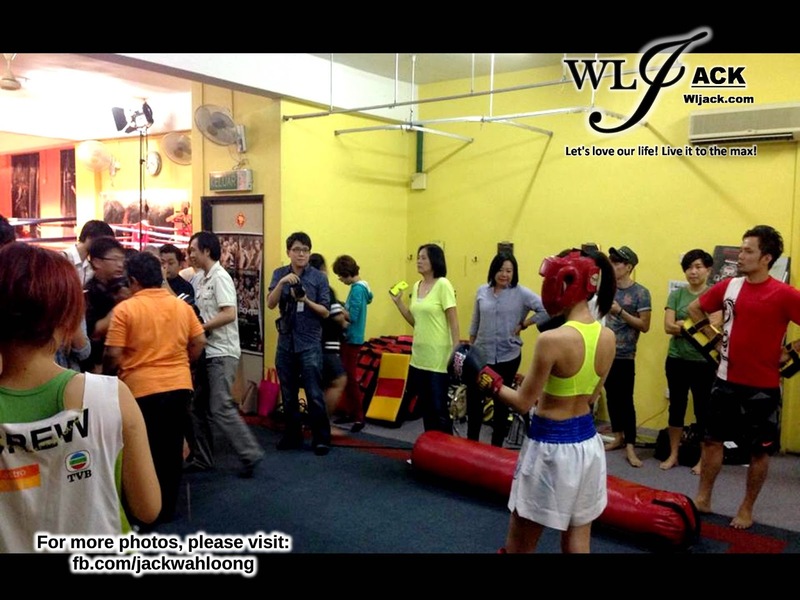 Apart from training, Nancy was also arranged to have a friendly match with Malaysia famous fighter Ella Tang 陈佩彬! This friendly match is a three-round match with Ella Tang陈佩彬. The judge for the match is the international fighter champion Master Khoo. In order to perform well, Nancy has come over to the centre earlier to get some advice from Master Khoo and she has undergone some training prior to the match. Worth-mentioning is, Nancy and Master Khoo will also demonstrate and teach the audience about the basics on how to do self-defense during her episode of the show. Besides, Thai Kickboxing is a sport which emphasizes a lot on being muscular for the advantage in fights. Thus, during this episode of “星级健康2” , Nancy will also be cooperating with professional dietician in sharing the tips on how to gain muscles and how to reduce fats for the body. “星级健康2”is a health programme show which combines the elements of many sports and involves the hosting by many TVB artistes. After Nancy’s episode this time, next episode will be hosted by Benjamin Yuen 袁伟豪 about swimming. Following him, Mandy Wong 黃智雯 and Elaine Yiu 姚子羚 will also be coming to Malaysia for the filming of this show. “星级健康2” will be shown from 20th July 2014 onwards, every Sunday, 8pm at Astro Wah Lai Toi 华丽台(CH 311) and Astro 至尊HD (CH 310) simultaneously. What do you think about hosting the thai kickboxing themed episode? Every artistes involved were to pick up a sports which they felt more related with. Somehow I was automatically being tasked for this theme due to my previous involvement in 拳王“Gloves Come Off”. I haven’t been training for quite some time until a few days before the filming today. This time is a bit different from the past because previously it was just acting. This time around, the friendly match felt like a real match. However, it is a good way to test my ownself on my endurance and would also be a good experience for me. Are you interested in fighting movies? Actually I am always interested in fighting genre. It’s actually a big challenge for me since “Gloves Comes Off” because Thai kickboxing does not have much of gears. Thus, it was quite difficult for me at first. However, since I could overcome the challenge in the past, I wouldn’t mind if opportunity is given to me in the future in other style of fighting. Do you think kissing a girl in your “The Ultimate Addiction 点金胜手” a challenge too? I think it is more like a psychological test. This type of scene is not common in usual drama. However, the intention of the kissing is not a romantic intention, it is just a test to see whether Kate’s character was really lesbian in the drama. It is a memorable acting experience for both her and Kate. What do you think of the stopping of “The Ultimate Addiction 点金胜手” airing in China mainland? Well, actually after a while we realized that there were really some minor elements which might be a bit sensitive in a few seconds of the scene. However, the appearance of the element was really very brief and not really intentional. It is such a waste because I heard that the viewership was quite good in China mainland before it was stopped from airing. Hopefully when it is being aired again, the viewership would be that high again. Bosco and I really wished to have the chance to go to China Mainland to promote the drama. “The Ultimate Addiction 点金胜手” finale will be aired this week. I hope that the rating would be high for the finale of the show in HK. What’s your current plan in acting? Before I came here to Malaysia, I just finished filming a drama for the past three months. It have been quite hectic too to promote “The Ultimate Addiction 点金胜手”. Following this, I would be taking part in the movie version of “Triumph In The Skies 衝上雲宵”. I haven’t told the HK audience yet about this. HK media reported that you have planned to take half-a-year break? I have responded to those media for many times in a year. Actually it is not true because I am putting my work as a priority first. I have no plan to get married or have children at the moment. Currently, I felt that I am at another stage of my career. So I will try to take the chances and do my best in career first. Recently you have taken photographs of Myolie in swimsuits, do you plan to release a photobook? Myolie loves to be captured in photographs to keep as memories while young. But I personally don’t like to be photographed. So usually I would just become the photographer for them. Your character in “The Ultimate Addiction 点金胜手” has received many positive feedback from the audience. Do you think you could win any awards with that character? Honestly, I think the feedback was a little bit unexpected. I have never expected that the audience would like the character. I also wished to know how the Malaysian audiences think of the character. Hope that Malaysian fans will love our drama. About winning awards, I think it’s still too early to think about it because there will be more dramas and characters in the next half of the year. I have tried my best and I am already quite satisfied with the reception now. It all depends on fate then. But I do hope my character could be nominated though. That’s all for the media Q&A session.